Our first activation for Saturday, 27th December, 2014, was the Whyalla Conservation Park. We had bid farewell to Marija’s mum, brother and family, and were enroute to Melrose in the southern Flinders Ranges, for a one night stay. 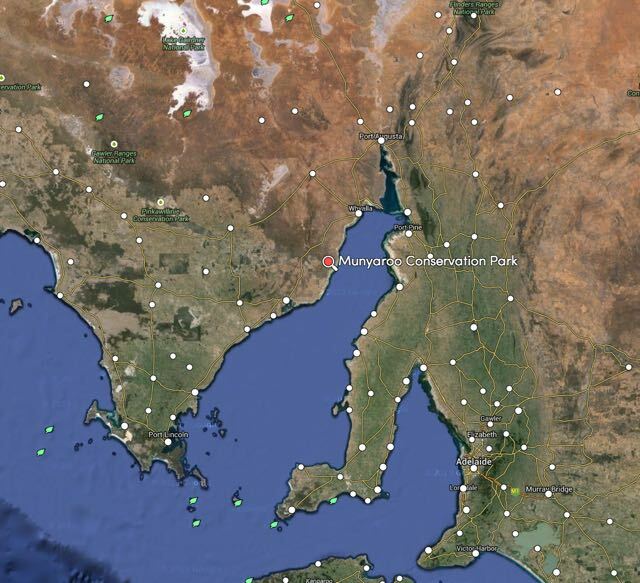 The Whyalla Conservation Park is located 10 km north of Whyalla off the Lincoln Highway, just passed the Port Bonython turn off. The last time (July 2013) I activated this park, we set up just inside the eastern boundary off the Lincoln Highway. 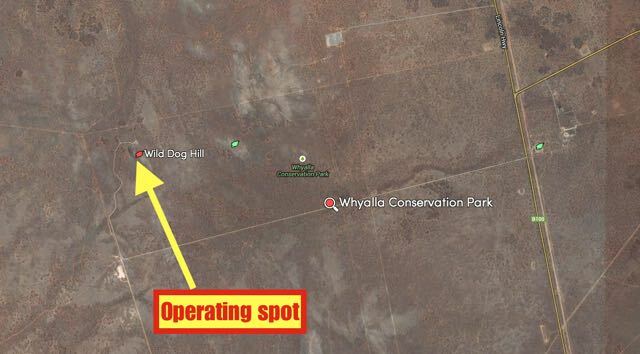 So, this time, Marija and I decided to enter the park off Lincoln Highway, but travel along Wild Dog Hill Road for a distance of about 8 km, until we reached the impressive Wild Dog Hill. It was here that we set up the gear, using the already provided concrete table and bench as the ‘shack’. I had only just started working stations when Mark VK5QI arrived. Mark and I had corresponded via email and on air, about catching up in the park. The band conditions on 40m were very poor, with lots of QSB. The normal hoards of park hunters were not there on this occasion. My first contact was with Les VK5KLV in nearby Port Augusta with a very strong 5/9 signal. This was followed by Larry VK5LY in The Riverland, and then Amanda VK3FQSO. Mark and I alternated on the radio. Whilst Mark was making contacts, I was admiring the view. Although Wild Dog Hill does not qualify for SOTA, as it does not have the required prominence, it is still very impressive and offers spectacular views of the surrounding outback countryside. Mark and I were lucky enough to be called by Ben VK5TX, just as we were about to pack up. Ben was on the top of Mount Gawler, VK5/ SE-013 (5/7 both ways). Despite the conditions being rather average, we also managed to work a couple of mobile stations. The first being Tim VK3AV who was mobile at Portland in western Victoria (5/8 sent and 5/6 received), and Matt Vk5ZM who was mobile at Tintinarra in south eastern South Australia (5/7 sent and 5/3 received). So after one hour in the park, I had a total of about 20 QSO’s in the log from VK3 & VK5, whilst Mark had about the same number of QSOs. 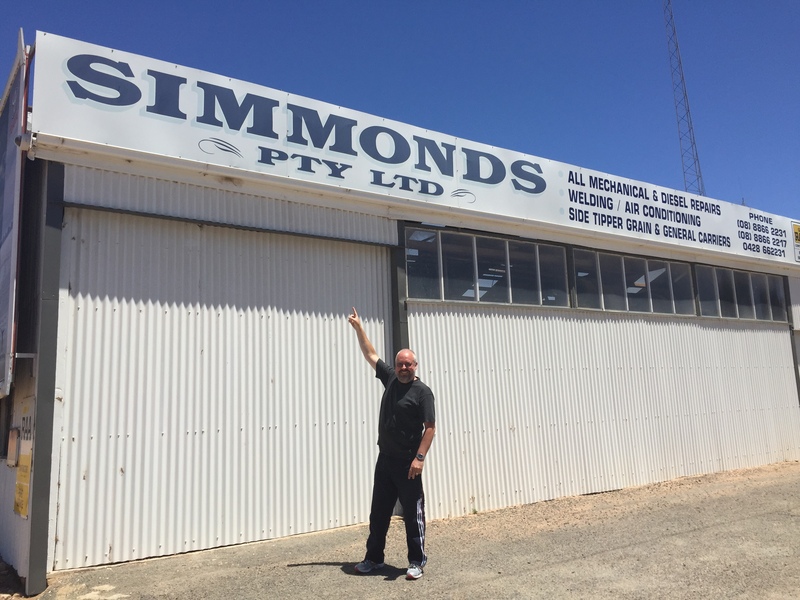 On Christmas morning, my wife Marija and I travelled to Whyalla in the ‘Iron Triangle’ north of Adelaide, to spend Christmas with family and friends. And on Friday afternoon, 26th December 2014, with the formal Christmas festivities over, and an additional 5 kg added to my waistline, Marija and I went for a drive south of Whyalla to the Munyaroo Conservation Park (CP). 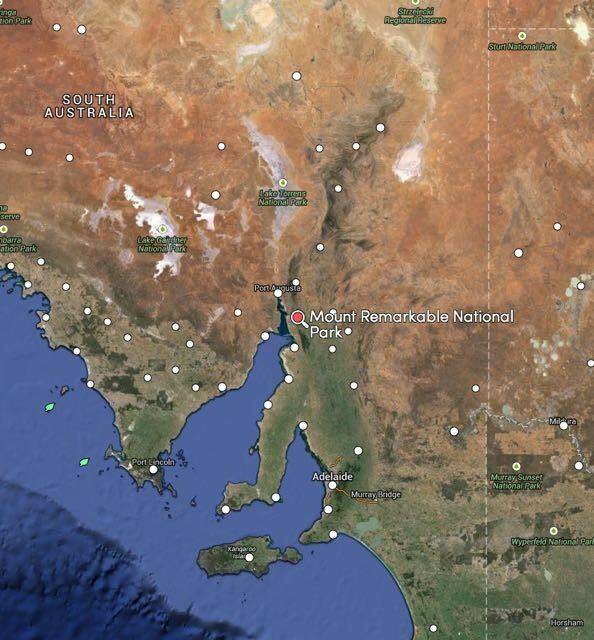 Firstly, where is Whyalla? 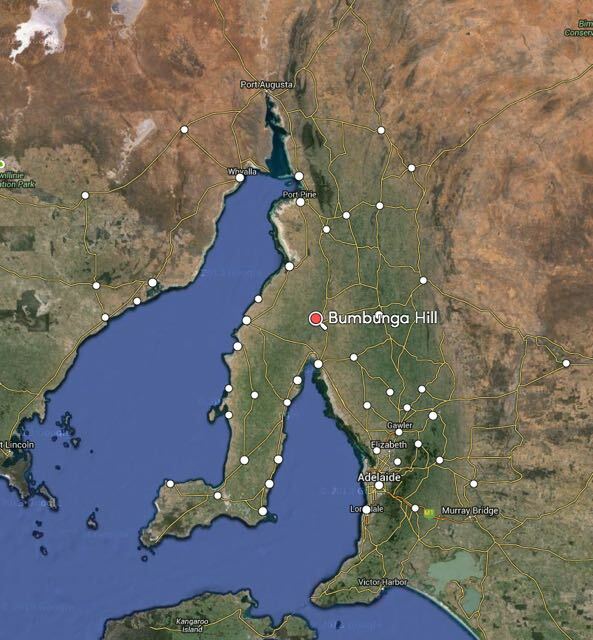 Well, Whyalla is located about 385 km north of Adelaide, via Port Augusta. 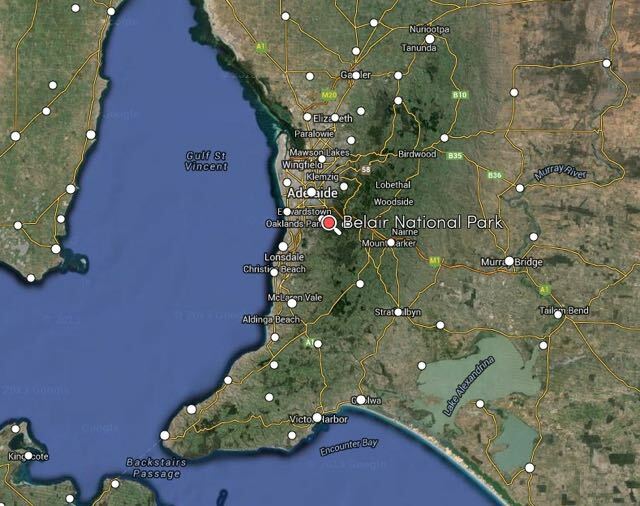 It is located on the eastern side of the Eyre Peninsula, with its shores on the Spencer Gulf. It was first founded in 1901 and was known as Hummock’s Hill. Then in April 1920, it was proclaimed as Whyalla. The town is known as the ‘Steel City’ due to its integrated steel works and ship building heritage. 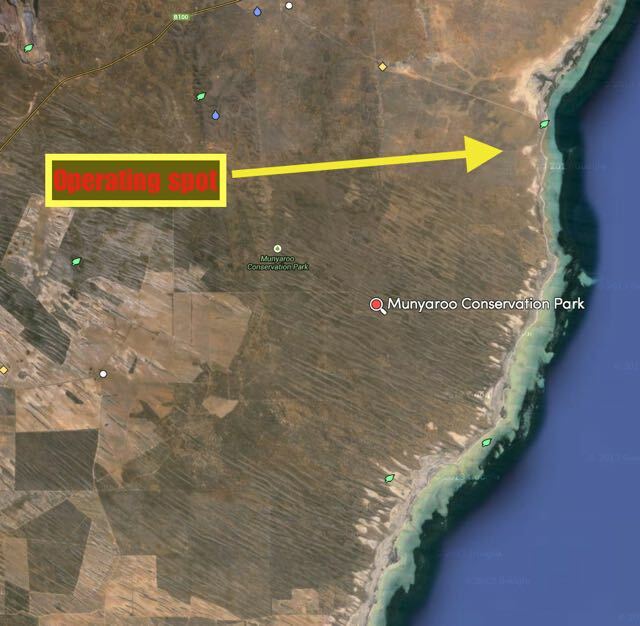 The Munyaroo Conservation Park is situated about 45 km south of Whyalla, on the way to the seaside town of Cowell. Munyaroo Conservation Park is 123 km2 and was proclaimed in 1977 with the purpose of conserving mallee and saltbush between agricultural and pastoral properties, and mangrove and samphire communities along the coastal fringe. Being being gazetted as a park, the area was used for grazing, and a small coastal strip was cropped. The ruins of farm dwellings and implements can be found in the park. Now, don’t be put off. It isn’t easy to find roads on many maps which show access to this park. But, access is gained via Moonabie Station. Again, don’t be put off by the ‘Private property’ signs. You can access the park via Moonabie. But, PLEASE, shut all the gates that you pass through. The road takes you all the way down to the park and Muminnie Beach, where there are a number of shacks. Vegetation in the park includes low open woodland of western myall and false sandalwood, over a shrubland of bluebush and bladder saltbush. Other vegetation includes an open scrubland of gilja, yorrell and red mallee over bluebush, dryland tea tree porcupine grass, candlebush and twin leaf on the dunes. In the northern area of the park grow native peach trees, native cypress pines, weeping pittosporum and western myall. The park is home to a large variety of birdlife including Emus, Malleefowl, Stubble Quail, Wedge Tailed eagles, Cormorants, Oystercatchers, and Rainbow Bee eaters. A large variety of native animals are also found in the park including Red Kangaroos, and Sandhill Dunnarts. After travelling south along the Lincoln Highway towards Cowell for about 45 km, we turned left onto a dirt track. There is a sign here indicating ‘Moonabie Station’. You will shortly thereafter come to an open gate at this location, with a cattle gird. The fence has a sign on it stating ‘Moonabie Private Property’. Follow this road to the east, towards the ocean. You will travel through a couple of closed, but iunlocked gates. You will then reach another gate which has a sign for ‘Mullaquana Station’. A number of km down this dirt track you will reach Muminnie Beach. On your way, you will clearly see the scrub of Munyaroo CP on your right. Marija and I found a nice quiet little spot, on a 4WD track amongst the scrub and set up the gear. I ran my new Yaesu FT-857d at 40 watts for this activation. Prior to calling CQ, I had a quick look around the 40m band and found Joe VK3YSP in conversation with Tim VK3MTB. Joe was on his Christmas/New Year road trip, and was portable in the Warby Ovens National Park, north west of Wangaratta. I waited until Joe had finished his QSO and gave him a call. Joe had a beautiful 5/9 signal coming into Munyaroo. I also spoke with Joe’s wife, Julie VK3FOWL. Joe and Julie are regular park activators and hunters. Joe was kind enough to allow me to have a chat with Tim VK3MTB, who although a little weaker, was still a good 5/7 signal all the way to the Eyre Peninsula. I then QSY’d up to 7.105 and called CQ. 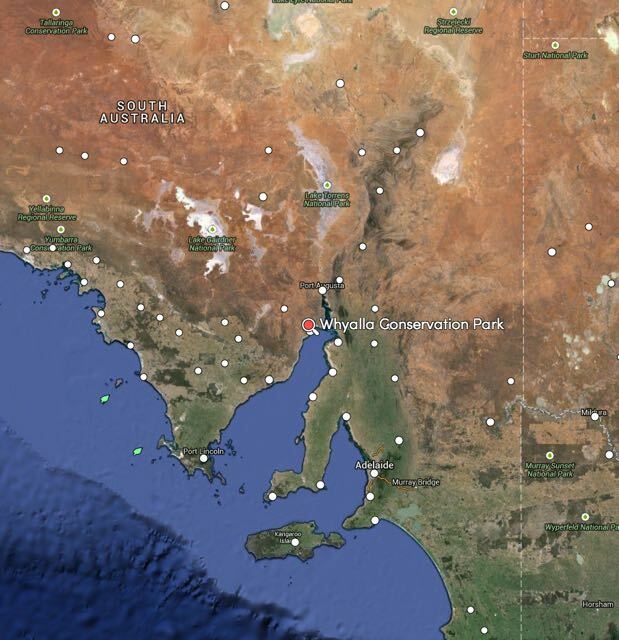 My first taker was Mark VK5QI who was portable in Whyalla, on holidays with family for Christmas. As expected, Mark was making the radio jump off the table. This was followed by park regulars, Greg VK5GJ at Meadows in the Adelaide Hills, and Nev VK5WG at Crystal Brook in the Mid North of South Australia. This was followed by a call from Bob VK5FO who was portable in the Morgan Conservation Park in The Riverland. Again, Bob was a terrific 5/9 to the west coast. I know that Bob specifically stuck around so that we could get a park to park contact. Thanks a lot Bob. I went on to work a further 11 VK5 stations, and then to my surprise, I received a call from Rob VK4FFAB, who was portable in the Glass House Mountains National Park, between Brisbane and the Sunshine Coast. And wow, did Rob have a great signal, 5/6 to Munyaroo. Rob is newly licenced and has really embraced the parks activities and the Summits on the Air (SOTA) program. He is a regular VKFF Activator and Hunter. After a little over an hour in Munyaroo CP, I had a total of 29 contacts in the log from VK3, VK4, & VK5. Scientific Expedition Group, Expedition Munyaroo Eyre Peninsula, Expedition Handbook, 2002. 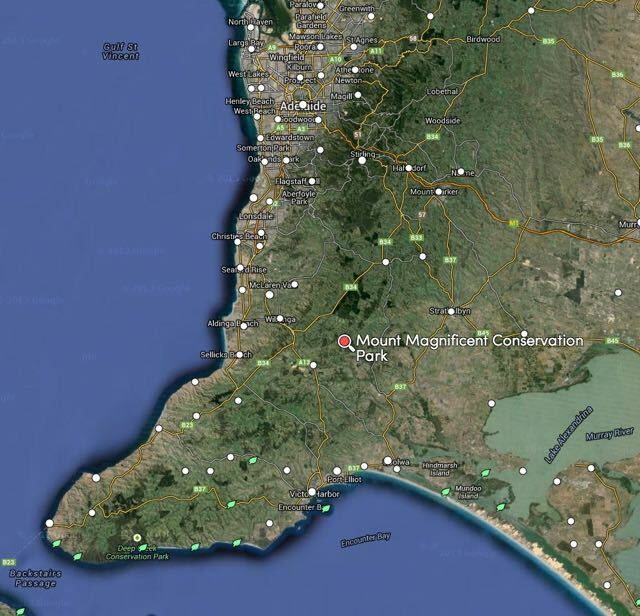 This afternoon I travelled to the Mount Magnificent Conservation Park (CP), which is about 8km north east of the town of Mount Compass, on the beautiful Fleurieu Peninsula, about 58 km south of Adelaide. This is a veery scenic drive from my home qth at Mount Barker, through the towns of Echunga, Meadows, and then on to Prospect Hill. I last activated this park in July, 2013, so today’s activation was another 1 point for me for the VK5 National and Conservation Parks Award. 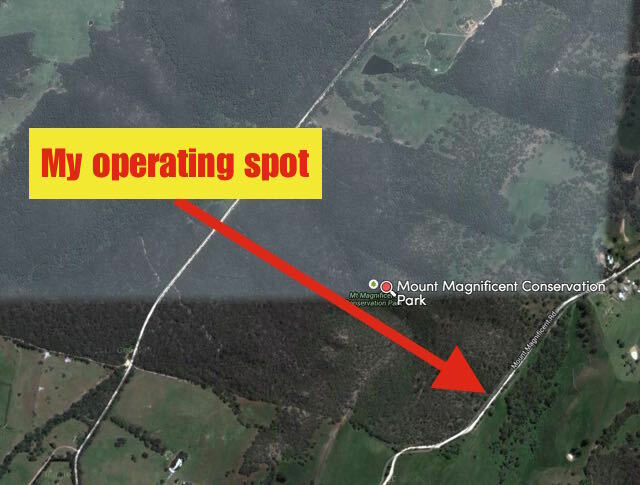 Here is a link to a post re my previous activation…..
Mount Magnificent CP was established in 1972, and is about 90 hectares in size. It protects a small area of remnant bushland. The major feature of the park is the 380 metre high Mount Magnificent, which sadly does not qualify for the Summits on the Air (SOTA) program), as it does not have the required ‘prominence’. Despite this, there are excellent views from the top. The famous Heysen trail passes through this park and links the nearby Finnis Conservation Park and the Kyeema Conservation Park to the north west. The park is full of a variety of native wildlfie, including Western Grey kangaroos. And there were plenty of these to be seen. I set up on the eastern side of the park, on the western side of Mount Magnificent Road. I was not all that far from the south eastern corner of the park. Part of the fenceline here had collapsed from the weight of falling branches from the gum trees, so access to the park was very easy. I set up my fold up table and deck chair, about 5 metres in from the boundary fence. Prior to calling CQ I had a quick tune around the 40m band and I found Paul VK1ATP portable on SOTA peak Mount Majura, VK1/ AC-034, calling CQ on his own on 7.090 (5/7 both ways). That was a nice way to start the activation for me. I then went up to 7.095 and starting calling CQ and this was immediately responded to by Arno VK5ZAR, and then Les VK5KLV in Port Augusta. Les is becoming a real regular park hunter now, which is great to see. I was then called by Stuart VK5STU who was portable in the Sandy Creek Conservation Park. Stuart had a very strong 5/9 signal, and it was great to be able to get a ‘park to park’ contact. Mick VK3FAFK from Stawell then called in and he was kind enough to place me on the parksnpeaks site. 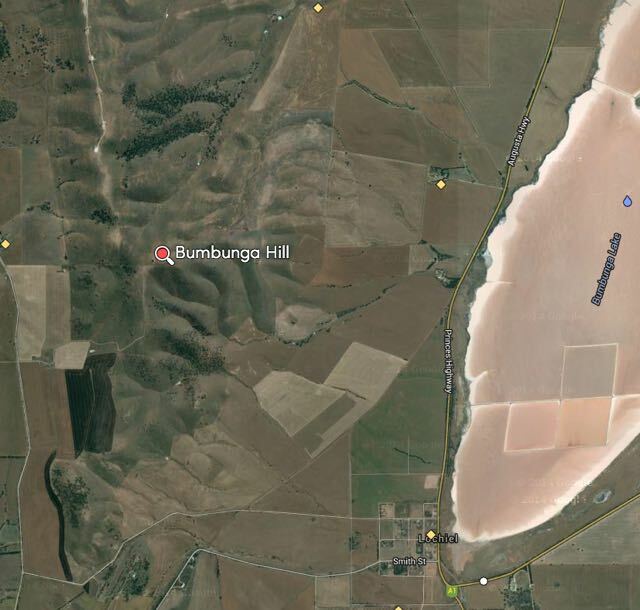 A few QSOs later I was called by Andrew VK1NAM/3 who was portable on Arthurs Seat, VK3/ VC-031. And then a little further down the log I was called by John VK5BJE who was portable in the Greater Bendigo National Park, which qualifies for the Keith Roget Memorial National Parks Award (KRMNPA) and also qualifies for the World Wide Flora Fauna (WWFF) program. 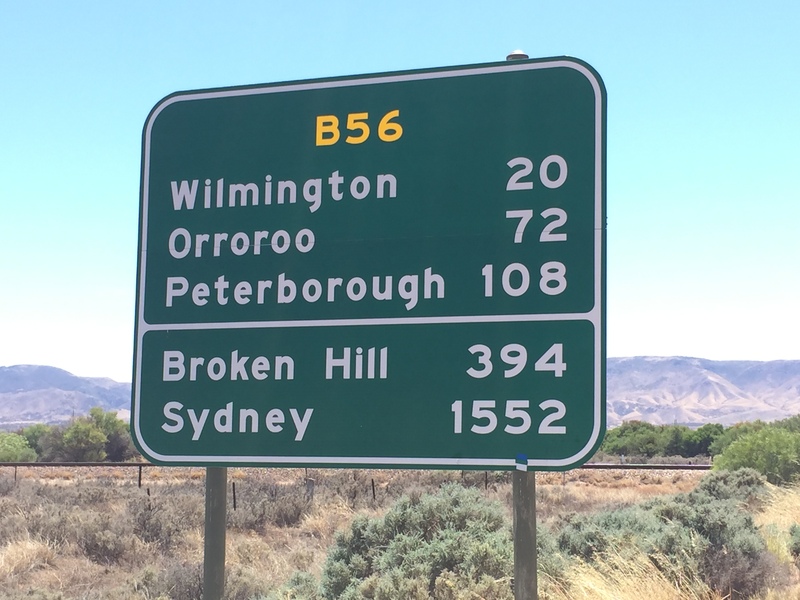 Greater Bendigo NP is VKFF-623. After working a total of 22 stations on 40m SSB, I lowered the squid pole and removed the links and headed up to 20m. I called CQ on 14.205 and this was answered by Jeremy VK4EVE, with a strong 5/9 signal. Sadly, a Japanese station moved in on 14.206 and that was the end of that. I tuned across the band and found Juha EA8/OH1LEG who was calling CQ. I gave Juha a call, and to my surprise, he responded. I only received a 5/3 signal report from Juha, but I was very pleased that I was able to make it to the Canary Islands. I kept tuning across the band and then worked Lauro IK4GRO (5/8 sent and 5/5 received). I headed back to 40m and tuned across the band and found W1AW/KH6 calling CQ on 7.183. He was not busy so I gave him a call. After a number of attempts with my call sign, we made a valid contact. The SOTA Goat app on my iphone bleated and I saw that there was a spot for Andrew VK3JBL/6. SO I headed back up to 20m, and although it was a bit of a struggle, I was able to make contact with Andrew (3/4 sent due to the static crashed and 4/5 received). I haven’t worked that many VK6 summits, so I was very pleased to make contact with Andrew. I went on to work Orlando, EA8CCQ, in the Canary Islands. orlando was using a rotary dipole, and we were able to have a comfortable QSO (5/9 sent and 5/5 received). It was starting to get a bit cool and the local time was just after 7.00 p.m. so I decided to pack up and head home. As it was, it was a very slow drive, as the roads were covered in kangaroos. After 2 hours in the park I had a total of 28 QSO’s in the log. Department of Water, Environment and Natural Resources, ‘Parks of the Fleurieu Peninusla’, 2011. 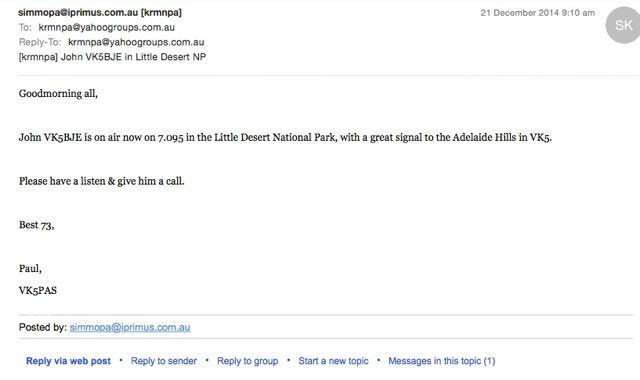 This morning, I received an SMS message from John VK5BJE advising me that he was on air in the Little Desert National Park. So in the throws of making my coffee, I headed to the radio shack and there was John on 7.095 with a great 5/9 signal from western Victoria. John was keen to get as many contacts as possible for the World Wide Flora Fauna (WWFF) program, so I set about trying to alert as many other amateurs as I could to John’s presence on the band. I kept listening, and it was really pleasing to hear John end up with a large pile up, with many of the stations I had alerted either via SMS, email, etc, giving him a call. and during various presentations I’ve delivered, but I thought I would mention this again. PLEASE, don’t become a black hole, and keep the contact to yourself. 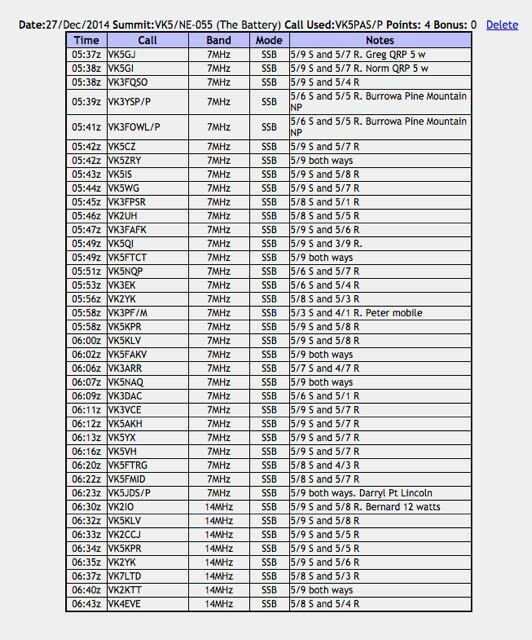 Remember, that many of the National Park activators are seeking the required 44 QSOs for the WWFF global award program. So the more calls they get, the better. There are currently no phone apps similar to SOTA Goat or Rucksack radio, for park activations. So park activators are relying on the goodwill of park hunters to let other amateurs know that they are in a park. So, what can you do to let others know that a park activator is on a particular frequency? The answer is quite a bit. Consider setting up an SMS group on your mobile telephone. A few amateurs are doing this, and it works extremely well. If you work a park activator, send an SMS to your group, advising your mates of your contact, so that they too, can hopefully make contact with the park activator. Here is a link to the recent presentation given by Brian VK5BC at the Welcome to amateur radio symposium….. The parksnpeaks site is a terrific spotting and alert facility created by Allen VK3HRA. The parksnpeaks site is FREE to join. Just simply register a new account. The parksnpeaks site has some excellent features. It can be used to add VK activity including QRP operation, National Parks, Conservation Parks, or portable operation in general, whilst SOTA spots are added directly via SOTAWatch. ‘Spotting’ is where you can add details of stations you have worked or heard. This allows you to share information with other amateurs. ‘Alerting’ is where you can add details of your proposed activations, so people can see what your future plans are. Send an email to your mates. Creating an email group is easy. If you are using Gmail….. If you use another email platform, there are plenty of tips on the internet regarding creating groups. Place a post on the World Wide Flora Fauna or VK5 Parks Yahoo groups. 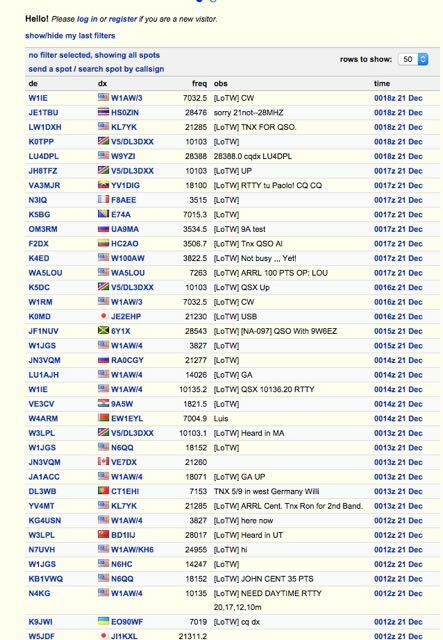 Send a message out to other amateurs on your local repeater. I know that many of the amateurs in the South East of South Australia, are doing this, and it works well. The World Wide Flora & Fauna program (WWFF) does not have a spotting & alert facility like SOTAwatch. But Activators are encouraged to place their intended activations on the WWFF Forum. A huge number of European amateurs read the Forum and will be able to see your intentions. So, as you can see there is a lot you can do. So please, after working a park activator, don’t just sit back and do nothing. Consider sharing your contact with other like minded amateurs. You are not only benefiting the other park hunters, but also the activator themselves. Yesterday (Saturday 20th December, 2014) I activated the Belair National Park (NP), VKFF-022, in the Mount Lofty Ranges ‘Adelaide Hills’. I had already activated Belair NP earlier in the year, so there were no VK5 Park Award points up for grabs. And I had already passed the 44 QSO threshold for Belair NP in the World Wide Flora and Fauna (WWFF) program. But my real motivation, was to try out my new radio. My beautiful wife Marija (and yes I am constantly reminded I am ‘boxing above my weight’) and my lovely daughter Olivia, purchased a Yaesu FT-857d for me, and gave it to me as an early Christmas present and early 50th birthday present. I turn 50 on the 5th January. So it was off to Belair for me, just a 15 minute drive to the west from home. I set up just inside Gate 1 off Sheaok Road, at Crafers. This is on the northern side of the park. This gate was locked, however there is no restriction to access to the park at this point. There is a walking track here, Wilyawa Track. But to gain access to it, you need to either jump the fence, which has barbed wire, or jump the padlocked gate. Why DEWNR do not have a pedestrian access point here I do not know? Anyway, I got all the gear from the 4WD and then jumped the fence and walked a short distance down the track, where I set up my station, under the shade of some gum trees, as it was a warm 30 deg C day. I started off on my nominated frequency of 7.095. I had posted on the VK5 Parks Yahoo group and the WWFF Australia Yahoo group that I would be on air at 0600 UTC on 7.095. I was about 15 minutes late, but still did not have to call CQ. I asked if the frequency was in use and this was responded to by Les VK5KLV at Port Augusta with a beautiful 5/9 signal. Les gave me a 5/9 in return, and it seemed the band was in very good shape. It was certainly very quiet. There was no man made noise on the band due to the remote location of the park, and the QRN (static crashes) that have been present over the past few weeks were noticably absent. My second caller of the day was Adam VK2YK who was a good 5/8. Adam was struggling with me a little bit due to QSB, but gave me a 5/4 signal report. This was followed by Mal VK5MJ in The Riverland in South Australia, who was 5/9 plus. David VK5KC then called me, using just 1 watt, and was a very nice 5/8 signal. I had already caught up with David earlier in the day for a coffee. I went on to work a further 20 stations in VK1, VK3, and VK5. 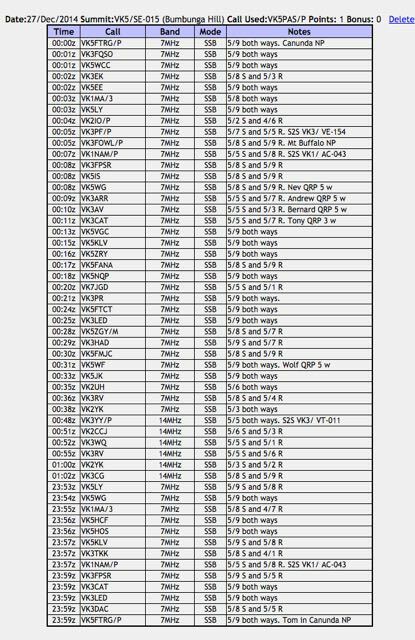 A few of those stations were operating QRP. The first QRP caller was Peter VK3TKK who was running just 5 watts. Peter’s signal was only signal strength 3, but due to the low noise floor, I was able to receive him perfectly. This was followed by Andrew VK1NAM mobile in VK3, in the outer eastern suburbs of Melbourne. Andrew was running just 2.5 watts from his FT-817 in the car, but nether less had a great 5/7 signal. Tom VK5FTRG then called in from the South East of South Australia, running just 5 watts, with a nice 5/9 signal. My final QRP caller was regular QRP operator, Ian VK5IS, again running 5 watts. Ian had a beautiful 5/9 signal coming in from the Mid North of South Australia. I also worked a few mobile stations. Other than Andrew mentioned above, I also spoke with Greg VK5ZGY who was mobile in the South East of South Australia, with a good strong 5/7 signal. Greg had co pilot and wife, Gabbie, alongside of him. I then spoke with Ian VK6PXF who was mobile in VK5 at Lonsdale, south of Adelaide. Ian has started activating National Parks, and has sent me quite a few of his logs for upload to the WWFF Log Search facility. And lastly I was called by Robin VK5TN who was mobile at Hahndorf in the Adelaide Hills. But to make my day, I was called by Richard VK5ZRY, who had decided to head out to the Ramsay Way Conservation Park. 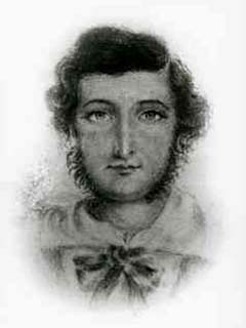 The park is/was located on Richard’s property on the Yorke Peninsula. Richard was trying out his new Yaesu FT-817 and had a magnificent 5/9 signal coming across the Gulf St Vincent to Belair. I left the frequency to Richard, and lowered the squid pole and removed the links in the dipole, so I could operate on 20m. However, I was disapointed when I tuned across 20m, to hear only very weak signals coming in from Europe. I found that my nominated frequency of 14.244 was clear, so I put out about 8 CQ calls but had no takers. Rather disapointed, I tuned across the 20m band and could hear three stations coming in from Spain. However, their signals were well down compared to normal conditions. I also heard Jason ZL3JAS, working long path into Europe. However, all the European stations he was making contact with, were very weak to me. So I headed back to 40m. Prior to calling CQ again, I tuned across the 40m band and I could hear quite a few Europeans & stations from the United Kingdom coming through, including Javier, EA7GAK on 7.178 who was working into the USA. I gave Javier a few calls, but sadly he could not hear me. I also heard W1AW/3 on 7.161 working into Europe. I also called him, but again my 40 watts just wasn’t making the grade. So I went back to 7.095 and called CQ again, and this was responded to by Nic VK5ZAT who was portable at Carrackalinga on the Fleurieu Peninsula. I had worked Nic a little earlier, prior to QSYing to 20m. He had been having problems with a high VSWR on his dipole. And this time, his signal had dropped down a good 2 S points. I was then called by Mick VK3FAFK in Stawell in western Victoria, with a beautiful 5/9 signal. And this was followed by Andrew VK5UR mobile in VK2, about 100 km south of Parkes. I had a lengthy chat with Andrew and his signal always remained around the S9. Andrew was running an IC7100 and a roof mounted whip antenna. My last contact on 40m was with Adam VK2YK who had called in again, as conditions had improved. I was now 5/9 with Adam, and he was 5/9 plus. I worked a further 13 stations from VK2, VK3, VK4, & VK5. My curiosity had got the better of me, so I again lowered the squid pole and removed the links in the dipole, and again tuned to 20m. I was hoping that the band had improved. But it was getting a little late, approaching 8.00 p.m. Again, I could hear some weak Europeans, who were certainly not strong enough for me to try to make contact with. I managed just 1 DX contact and that was with Michio, 7L4LKK, who was a strong 5/9 to Belair. So after a number of hours in the park, I had a total of 41 contacts in the log.